A 4,800-pound care package is on its way to the International Space Station aboard a SpaceX Dragon spacecraft. 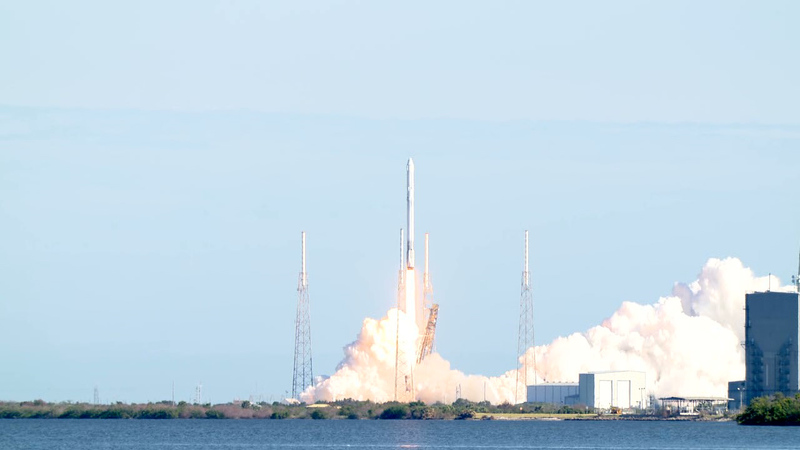 The company’s 13th commercial cargo mission to resupply the space station began at 10:36 a.m. EST with liftoff aboard a SpaceX Falcon 9 rocket from Space Launch Complex 40 at Cape Canaveral Air Force Station in Florida. After a successful climb into space, the Dragon spacecraft now is in orbit with its solar arrays deployed and drawing power. The rocket’s first stage flew back for a successful landing at SpaceX’s Landing Zone One at Cape Canaveral Air Force Station. The Dragon spacecraft will deliver science, research, crew supplies and hardware to the orbiting laboratory. Science experiments include the Total and Spectral Irradiance Sensor (TSIS-1) that will measure the Sun’s energy input to Earth, the Space Debris Sensor (SDS) that will directly measure the orbital debris environment around the space station for two to three years, and the Advanced Colloids Experiment-Temperature 7 (ACE-T-7) investigation, which involves the design and assembly of 3-D structures from small particles suspended in a fluid medium, structures that are vital to the design of advanced optical materials and electronic devices. Read more at https://go.nasa.gov/2mMUdSY. Live coverage of the rendezvous and capture of the Dragon spacecraft will begin at 4:30 a.m. Sunday, Dec. 17 on www.nasa.gov/live, with installation coverage set to begin at 7:30 a.m. Astronauts aboard the station will capture the Dragon using the space station’s robotic arm and then install it on the station’s Harmony module. The Dragon spacecraft will spend about one month attached to the space station, returning to Earth in mid-January with results of previous experiments.